Understanding mechanisms of proteinuria, immune mediated inflammation and autoimmune diseases affecting the kidney and the systemic circulation. 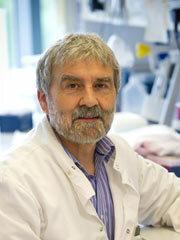 I trained in biochemistry at the University of Birmingham and in immunology at the University of Manchester. Following a postdoctorate project in tumour immunology, I worked in clinical immunology at St Marys Hospital, Manchester becoming a consultant scientist in immunology in 1990. Since 1998, I have been Director of Renal Research Labs at Manchester Royal Infirmary. I was awarded an honorary chair in renal immunology in School of Medicine, University of Manchester in 2003. The education and teaching focus of the research lab is in training clinical fellows in renal research, (6 M.D.s, 8 Ph.D.s last 15 years) with 4 current research fellows in training in 2013. Ebah LM, Wiig H, Dawidowska I, O’Toole C, Summers A, Nikam M, Jayanti A,Coupes B, Brenchley P, Mitra S. Subcutaneous interstitial pressure and volume characteristics in renal impairment associated with edema. Kidney Int. 2013 Jun 5. doi: 10.1038/ki.2013.208. [Epub ahead of print] PubMed PMID: 23739231. Coenen MJ, Hofstra JM, Debiec H, Stanescu HC, Medlar AJ, Stengel B, Boland-Augé A, Groothuismink JM, Bockenhauer D, Powis SH, Mathieson PW, Brenchley PE, Kleta R, Wetzels JF, Ronco P. Phospholipase A2 receptor (PLA2R1) sequence variants in idiopathic membranous nephropathy. J Am Soc Nephrol. 2013 Mar;24(4):677-83. doi: 10.1681/ASN.2012070730. Epub 2013 Feb 21. PubMed PMID: 23431073; PubMed Central PMCID: PMC3609136. Kanigicherla D, Gummadova J, McKenzie EA, Roberts SA, Harris S, Nikam M, Poulton K, McWilliam L, Short CD, Venning M, Brenchley PE. Anti-PLA2R antibodies measured by ELISA predict long-term outcome in a prevalent population of patients with idiopathic membranous nephropathy. Kidney Int. 2013 May;83(5):940-8. doi: 10.1038/ki.2012.486. Epub 2013 Jan 30. PubMed PMID: 23364522. Hofstra JM, Debiec H, Short CD, Pellé T, Kleta R, Mathieson PW, Ronco P, Brenchley PE, Wetzels JF. Anti-phospholipase A2 receptor antibody titer and subclass in idiopathic membranous nephropathy. J Am Soc Nephrol. 2012 Oct;23(10):1735-43. Epub 2012 Sep 6. PubMed PMID: 22956816; PubMed Central PMCID: PMC3458465. Lyons PA, Rayner TF, Trivedi S, Holle JU, Watts RA, Jayne DR, Baslund B, Brenchley P, Bruchfeld A, Chaudhry AN, Cohen Tervaert JW, Deloukas P, Feighery C, Gross WL, Guillevin L, Gunnarsson I, Harper L, Hrušková Z, Little MA, Martorana D, Neumann T, Ohlsson S, Padmanabhan S, Pusey CD, Salama AD, Sanders JS, Savage CO, Segelmark M, Stegeman CA, Tesař V, Vaglio A, Wieczorek S, Wilde B, Zwerina J, Rees AJ, Clayton DG, Smith KG. Genetically distinct subsets within ANCA-associated vasculitis. N Engl J Med. 2012 Jul 19;367(3):214-23. doi: 10.1056/NEJMoa1108735. PubMed PMID: 22808956. Margetts PJ, Hoff C, Liu L, Korstanje R, Walkin L, Summers A, Herrick S, Brenchley P. Transforming growth factor β-induced peritoneal fibrosis is mouse strain dependent. Nephrol Dial Transplant. 2012 Jul 10. [Epub ahead of print] PubMed PMID: 22785109. Simmons SC, McKenzie EA, Harris LK, Aplin JD, Brenchley PE, Velasco-Garcia MN, Missailidis S. Development of novel single-stranded nucleic acid aptamers against the pro-angiogenic and metastatic enzyme heparanase (HPSE1). PLoS One. 2012;7(6):e37938. doi: 10.1371/journal.pone.0037938. Epub 2012 Jun 15. Ebah LM, Read I, Sayce A, Morgan J, Chaloner C, Brenchley P, Mitra S. Reverse iontophoresis of urea in health and chronic kidney disease: a potentialdiagnostic and monitoring tool? Eur J Clin Invest. 2012 Aug;42(8):840-7. doi:10.1111/j.1365-2362.2012.02657.x. Epub 2012 Mar 12. PubMed PMID: 22409780; PubMedCentral PMCID: PMC3437467. Dunn WB, Summers A, Brown M, Goodacre R, Lambie M, Johnson T, Wilkie M, Davies S, Topley N, Brenchley P. Proof-of-principle study to detect metabolic changes inperitoneal dialysis effluent in patients who develop encapsulating peritoneal sclerosis. Nephrol Dial Transplant. 2012 Jun;27(6):2502-10. doi: 10.1093/ndt/gfr662. Epub 2012 Jan 31. PubMed PMID: 22294777. Hutchison AJ, Smith CP, Brenchley PE. Pharmacology, efficacy and safety of oral phosphate binders. Nat Rev Nephrol. 2011 Sep 6;7(10):578-89. doi: 10.1038/nrneph.2011.112. Review. PubMed PMID: 21894188. Summers AM, Abrahams AC, Alscher MD, Betjes M, Boeschoten EW, Braun N, Brenchley PE, Davies S, Dunn L, Engelsman L, Fieren M, Garosi G, Goffin E, Heuveling L, Korte M, Lindholm B, Rutherford P, Struijk D, Verduijn M, Verger C, Westerhuis R. A collaborative approach to understanding EPS: the European perspective. Perit Dial Int. 2011 May-Jun;31(3):245-8. doi: 10.3747/pdi.2010.00086. Review. PubMed PMID: 21555409. Wright B, Summers A, Fenner J, Gillott R, Hutchinson CE, Spencer PA, Wilkie M, Hurst H, Herrick S, Brenchley P, Augustine T, Bardhan KD. Initial observations using a novel "cine" magnetic resonance imaging technique to detect changes in abdominal motion caused by encapsulating peritoneal sclerosis. Perit Dial Int. 2011 May-Jun;31(3):287-90. doi: 10.3747/pdi.2010.00078. Epub 2011 Mar 31. PubMed PMID: 21454394. Ebah L, Brenchley P, Coupes B, Mitra S. A modified in vivo flow variation technique of microdialysis for sampling uremic toxins in the subcutaneous interstitial compartment. Blood Purif. 2011;32(2):96-103. doi: 10.1159/000324207. Epub 2011 Mar 2. PubMed PMID: 21372567. Stanescu HC, Arcos-Burgos M, Medlar A, Bockenhauer D, Kottgen A, Dragomirescu L, Voinescu C, Patel N, Pearce K, Hubank M, Stephens HA, Laundy V, Padmanabhan S, Zawadzka A, Hofstra JM, Coenen MJ, den Heijer M, Kiemeney LA, Bacq-Daian D, Stengel B, Powis SH, Brenchley P, Feehally J, Rees AJ, Debiec H, Wetzels JF, Ronco P, Mathieson PW, Kleta R. Risk HLA-DQA1 and PLA(2)R1 alleles in idiopathic membranous nephropathy. N Engl J Med. 2011 Feb 17;364(7):616-26. doi: 10.1056/NEJMoa1009742. PubMed PMID: 21323541. 15: Clancy MJ, Marshall D, Dilworth M, Bottomley M, Ashton N, Brenchley P. Immunosuppression is essential for successful allogeneic transplantation of the metanephros. Transplantation. 2009 Jul 27;88(2):151-9. doi: 10.1097/TP.0b013e3181abbe9d. PubMed PMID: 19623009. 16: de Freitas D, Jordaan A, Williams R, Alderdice J, Curwell J, Hurst H, Hutchison A, Brenchley PE, Augustine T, Summers AM. Nutritional management of patients undergoing surgery following diagnosis with encapsulating peritoneal sclerosis. Perit Dial Int. 2008 May-Jun;28(3):271-6. PubMed PMID: 18474920. 17: Churchill AJ, Carter JG, Ramsden C, Turner SJ, Yeung A, Brenchley PE, Ray DW. VEGF polymorphisms are associated with severity of diabetic retinopathy. Invest Ophthalmol Vis Sci. 2008 Aug;49(8):3611-6. doi: 10.1167/iovs.07-1383. Epub 2008 Apr 25. PubMed PMID: 18441306. Harris LK, Baker PN, Brenchley PE, Aplin JD. Trophoblast-derived heparanase is not required for invasion. Placenta. 2008 Apr;29(4):332-7. doi: 10.1016/j.placenta.2008.01.012. Epub 2008 Mar 10. PubMed PMID: 18329709. Dilworth MR, Clancy MJ, Marshall D, Bravery CA, Brenchley PE, Ashton N. Development and functional capacity of transplanted rat metanephroi. Nephrol Dial Transplant. 2008 Mar;23(3):871-9. Epub 2007 Oct 12. PubMed PMID: 17933838. Harris S, Coupes BM, Roberts SA, Roberts IS, Short CD, Brenchley PE. TGF-beta1 in chronic allograft nephropathy following renal transplantation. J Nephrol. 2007 Mar-Apr;20(2):177-85. PubMed PMID: 17514622.